We reported in June 2015 that Henry Cooper Coaches had acquired seven Routemasters from TfL. Things have moved on considerably since then and the company are working through a major strip down and refurbishment programme including fitment of new radiators, new stainless steel exhausts, new hoses, stainless steel water pipes and new tyres. The undersides have been steam cleaned and painted silver and each vehicle has been individually assessed for any extra work, for example RM1562 has received a new staircase. The final stage of the refurbishment is to fit new new body panels, windows and window rubbers followed by a full re-spray. ALD 913B and 204 CLT have been completed and sold on to the company that operates BB Tours. They are having their interiors converted for this purpose by South East Coachworks in Kent . The conversion involves reducing the number of seats and the fitment of tables and a servery area. Although the work is extensive the buses can be easily be returned to original condition. RM 1562 has received the mechanical refurbishment and is awaiting bodywork treatment but in the meantime it is taxed and tested and available for private hire. As three Routemasters were booked out last weekend 1562 was pressed into service and I had the opportunity to drive the vehicle (562 CLT) on a wedding booking. 562 CLT awaits passengers outside the Civic Centre in Newcastle. This bus is the only one ever fitted with a Cummins ISBe engine and when in service in London was renowned for being the fastest ever Routemaster. It was also fitted with an Alison World Series 2000 gearbox with the push button gear selector fitted to the left of the steering column. The gear selector on other refurbished RM's is normally on the floor, to the left of the driver's seat. years now. Here it is seen in October 2015 with RM1640. The bus is certainly very sprightly and climbed hills with a full load with no effort whatsoever. A Telmar retarder is incorporated into the braking system, which helped bring the bus to a smooth confident stop when needed. 640 DYE is complete mechanically and is half way through a complete bodywork refurbishment which involves new panels, new glass, new window rubbers and a full re-paint. 218 CLT has been refurbished inside and out and is mechanically perfect and was one of the three Routemasters out in service last weekend. Before the next outing for this vehicle Henry Coopers are experimenting by replacing the sandwich rubbers that hold the back axle to the B frame. This is being done in anticipation that these rubbers will by now be worn and the work is being done in order to guarantee future reliability. This is the philosophy of Graham Greaves, the owner of Henry Coopers who prefers to change any part that might cause reliability problems. vehicle that Graham rescued from the scrap line at Plaxtons. 735 DYE and 776 DYE have been through the maintenance programme and await their eventual turn for a full bodywork refurbishment. They are both MOT'd and have received new radiators, intercoolers, water pumps and hoses, as well as stainless steel water pipes. garage erected in the area where they are parked. As well as acquiring the seven aformentioned vehicles Henry Cooper Coaches have also purchased RM 120 which was converted some years ago to open top. The plan is to fit a roof to this vehicle and completely refurbish it. A large amount of mechanical work has already been carried out, including oils changed, fuel pump refurbished, new injectors and gearbox seals replaced. It has an original AEC engine and gearbox and runs very well. The underside of the vehicle is extremely good and Graham considers it to be a good long term investment. It will probably jump the queue for bodywork and roof replacement and is likely be the next vehicle to be sent to Gardiners of Spennymoor who carry out all of Henry Cooper's bodywork requirements and who have done such an excellent job on the vehicles completed to date. 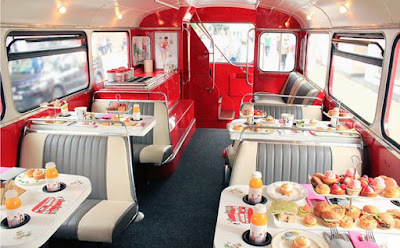 Henry Cooper Coaches - Routemasters facebook page where you will find an interesting range of pictures. Our previous articles about the Henry Cooper Routemasters can be found here and here.